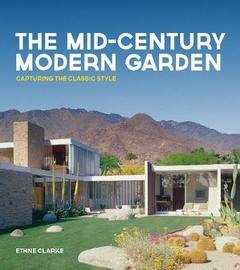 A lavishly illustrated exploration of mid-century modern landscaping as it first appeared during the inter-war period and as it has come to be interpreted today, with detailed advice on how readers can achieve the style for themselves. The Mid-Century Modern Garden links the design of homes and gardens popular during the mid-century period of 1940 - 1970 to contemporary style and the desire to create healthy, sustainable lives. A substantial introduction looks at the transformation of Modernism into Mid-Century Modern (MCM); the impact of war and how it led to the spread and development of modernism. There will be particular focus on Frank Lloyd Wright and Midwest modern, the arrival of Bauhaus on the East Coast of America, Post-War Suburbs and the rise of West Coast Ranch-style living. The book then outlines how to make a modern home landscape in the MCM style in six thematic chapters: the Outline: Plotting the lay of the land: Site, climate and indigenous flora. Soil and terrain The Plan: Designing for use and beauty: how to create meaningful relationships between the house and garden Inspiration Boards: Visualising a personal statement: Balancing richness with simplicity: Floors, walls, light, shade. Making it Sustainable: Under the hood maintenance matters: Irrigation, soil amendment, container planting. Materials: Textures, colours and shapes in hardscaping and planting schemes. Garden rooms: For outdoors living: kitchen, dining, relaxing, physical activity. Fully illustrated with archive and contemporary photographs and drawings in colour and black & white, all thematic chapters will include classic examples of mid-century architecture and landscaping accompanied by examples of gardens executed according to MCM principles, and drawn from the portfolios of contemporary designers in the USA, Europe and Pacific Rim. Ethne Clarke teaches at the University of Colorado and Colorado College on garden history and the ethnography of landscape. In 2013 Ethne published her book on the inter-war architect Cecil Pinsent with W. W Norton titled An Infinity of Graces. As well as her academic profile she is a hands-on gardener and garden designer and until recently was editor of Rodale's Organic Gardener magazine. She is currently refurbing her own mid-century modern house and garden in Colorado Springs.